Steaming in individual packets is an easy, delicate way to prepare fish. And, as an added bonus, this method also saves on cleanup! Red bell peppers provide a blast of Vitamin C for healthy skin and joints. Preheat oven to 400 degrees. 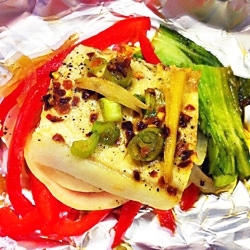 Place 4 large pieces of aluminum foil on a baking sheet and in the middle of each piece, place a mound of bok choy, red peppers, and onions. Top each mound of vegetables with a fish fillet. Season fish with black pepper, crushed red pepper flakes, scallions, sliced ginger and soy sauce (drizzle 1 tsp soy sauce over each fish fillet). Fold foil over fillets to make a pocket, and pleat seams to securely enclose. Bake in oven for 20 minutes or until fish is cooked to your preference.